The distillery found at "the mouth of the chattering brook", at the foot of the mighty Ben Rinnes mountain, Aberlour has stood tall over the whisky landscape of over 190 years. Set in the mystical and ancient oak lands of Speyside, nearby to historic and mysterious standing stones, Aberlour has produced some magical drams over the years, and is known for its delicious heavily sherried whisky. Part of the Chivas Brothers’ whisky empire, the brand is one of the top ten bestselling Single Malts in the world. The distillery has endured and survived disaster on more than one occasion in its long history, yet has always returned to produce whisky of extremely high quality. Renowned amongst whisky drinkers and writers for its great complexity, thick mouthfeel and rich flavours, with esteemed writer Michael Jackson saying: "Lovers of the richer style of Speyside malt rightly regard Aberlour as being in the top echelon". For these reasons the distillery continues to enamour fans the world over. Aberlour prides itself on having one of the most exclusive and high quality water source. Water is, of course, whisky’s largest ingredient, and Aberlour believes it should be treated with the same care and attention as distilleries treat barley and casks. The distillery draws its crystal clear water straight from the spring on Ben Rinnes, where it has been filtered by layers of peat, distinctive pink granite which gives the water only trace elements and leaves it extremely soft. Indeed, the water is so pure, that it requires no treatment before being used in the distillery. No water is wasted in the production of the spirit, drawing only the exact amount needed for each batch is drawn from the spring. Aberlour has a capacity of 3.9 million litres of pure alcohol per annum. Aberlour makes an unpeated malt using Optic, Oxbrdige, Braemar, Propino and Concerto barley varieties, which are mashed in a Semi Lauter stainless steel mash tun. The six washbacks are also stainless steel, and total fermentation time is 48 hours. The distillery uses a traditional pot still shape, heated by internal steam pans, which produce a new make of up to 70%. This spirit fills bourbon and sherry casks, with the distillery noted for using a high percentage of sherry cask to mature their spirit. The distillery uses mostly a racked warehouse, but also some dunnage maturation for certain bottlings. Drinkers of this fabulous malt can expect buttery, spicy, chocolaty flavours, with highlights of dried fruit and rich toffee. The first Aberlour distillery is founded by James Gordon and Peter Weir. Peter Weir leaves the operation, whilst James Gordon runs the distillery alone. After over 50 years of largely uneventful distilling, the distillery burns down. A local banker, named James Fleming, builds a new distillery a little way up the Spey river. This second incarnation of the Aberlour distillery is the one we know today, and this is what Aberlour considers its official founding moment. Fleming also owned the Daluaine distillery, and had supplied grain to many distilleries in the area for some time. The distillery was thoughtfully designed and modern, hailed at the time as the "perfect model distillery", powered entirely by a large waterwheel in the nearby Lour burn (steam power was the industry standard at the time). The Fleming family motto – "Let The Deed Show"- remained a constant inspiration during this fledging period for the distillery. Fleming was a conscientious employer, who took care of those at his company, and sort to improve the community within which it was based, building a town hall, school and a cottage hospital in the local village. Furthermore, after tragedy struck a ferry across the Spey, claiming several young lives, Fleming left provision in his will for the building of a suspension bridge. This remains across the river to this day. Fleming applied the same due care and diligence to the production of his wonderful spirit. Alfred Barnard visits the distillery as part of his tour of British spirits production, reporting it to be a charming and impressive operation, with an output of some 80,000 gallons (just over 360,000 litres). The distillery is expanded by its new owners Robert Thorne & Sons Ltd. The distillery bottles one of the earliest examples of an Aberlour ‘Pure Malt’- the ancestor of what we now know as a Single Malt Whisky. James Fleming dies aged 65, and is buried opposite the distillery where he keeps a watchful eye over proceedings. Disaster strikes again! As a result of an explosion within the malt mill, the distillery suffers another catastrophic fire, which leaves it virtually flattened. The vast majority of the whisky stocks are destroyed. The distillery calls upon the skills of architect Charles Doig, the nation’s premier distillery architect, to plan the new distillery structures. Many of these features remain at the distillery to this day. Six months after the initial devastation, whisky trickles from the stills again, in a remarkable turnaround. As the First World War takes its toll on the distillery, it closes for two years. 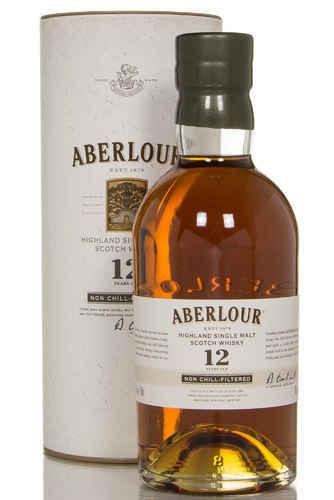 Aberlour is sold to W.H. Holt & Sons. They own the distillery until 1942, when it is briefly owned by James Donald Stewart, but as a closed distillery. The end of the Second World War marks a change of owner, with Clan Campbell buying the distillery, they would own it until 1972. S. Campbell & Sons would undertake several changes to the running of the distillery, somewhat industrialising and modernising its facilities. The old waterwheel is retired as the distillery moves to electricity, whilst the stills change from being directly fired to steam heated. The distillery stops using its floor maltings, a practice that is only continued by a handful of distilleries to this day. A titan of Aberlour’s history, Ian "Puss" Mitchell, first becomes distillery manager. He would continue in the role until his death in 1992, overseeing a period of prolonged success for the Speysider. The distillery is expanded and renovated, with two more stills added, to make a total of four- two wash stills and two spirit stills. This is partly to cope with the demand for Dewar’s blends, of which Aberlour was a key ingredient. French drinks giants Pernod Ricard buys Campbell Distilleries. This ownership would make the brand particularly prominent in France, with some bottlings released only within that nation. In a short stint at the helm, Douglas Cruickshank becomes distillery manager. He is succeeded by Alan Winchester, who partners with David Boyd as Chief Blender. 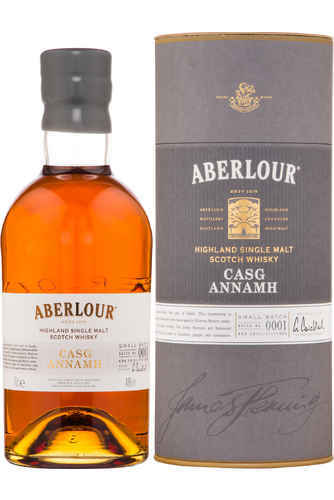 Pernod Ricard releases Aberlour A’bunadh, a high strength bottling (coming in at around 60%) matured entirely within Oloroso sherry casks, this has become a real cult classic of the Aberlour line, released in batches throughout the year. A special cask strength 30 year old bottling is also released this year. The distillery also releases a selection of dunnage warehouse matured single casks for certain whisky shops, charities and loyal customers, which have become rather collectible. Pernod Ricard buys the Chivas Brothers brand from Seagrams and rearranges its portfolio, merging Campbell Distilleries with the operation, under the Chivas Brothers brand. The distillery unveils its modern visitor centre, and becomes one of the first in Scotland to offer "bottle your own" services for touring whisky fans- something that has become something of an industry standard since. At some point in these early noughties years, Aberlour overtakes Glenfiddich to become the best selling Single Malt whisky in the country- an admirable achievement, largely down to their French ownership. From the late 1980s onwards, the distillery went on something of a medal winning spree, winning gold awards in the International Wine and Spirits Competition for the years: 1986, 1990, 1996, 1998, 1999, 2001 and 2003. The 18 year old offering becomes available outside of France for the first time. Alan Winchester moves on to become the Master Distiller at the Glenlivet, whilst Stuart Pirie, former head distiller at Scapa, becomes Distillery Manager.